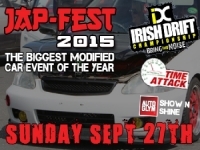 USPA NEWS - Ireland’s only festival of Japanese Motoring & Motorsport, this year takes place at Mondello Park Sept. 26th & 27th & 28th, with Sunday 27th being main event. There will also be plenty to see off track with displays of Irelands best Modified Japanese cars an extensive trade area & other attraction. The show will feature the finale of the 2015 Irish Drift Championship starring a field of international drift Superstars including Japenese Drivers, Robbie Nishida and Daigo Saito. Also on the bill will be the final round of the Irish Time-Attack championship, which will be the main main supporting event. The centrepiece of the Jap-Fest Track Action will be the finale of the 2015 Irish Drift Championship featuring a Star Studded entry list of Irish and International Drivers. The IDC Drift Champiosnhip will take place over two days with the Rookie and Semi-Pro drivers competing on Saturday and the Pro Drivers competing on Sunday. Also on track will be the final round of the 2015 Irish Time-Attack Championship and high speed track Day sessions which are open to clubs and individuals. Cars for this area come from web sites, forums and individual owners, with all cars being vetted to ensure only the best of Ireland’s modified Japanese metal makes it into the show. Any car on display is also elegible for the Show ‘N’ Shine competition which this year will be judged by Autoglym. 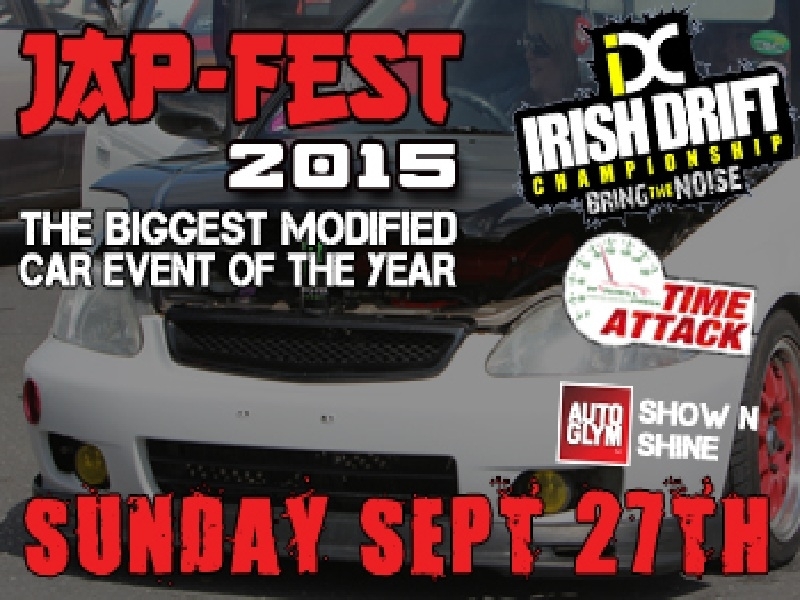 The Jap-Fest Trade area will have everything for the Modified Car fan and will be situated behind and in the Mondello Park Pit Lane garages. The Japanese automotive industry is one of the most prominent and largest industries in the world. Japan has been in the top three of the countries with most cars manufactured since the 1960s, surpassing Germany. The automotive industry in Japan rapidly increased from the 1970s to the 1990s, Japan is now currently the third largest automotive producer in the world. The country is home to a number of companies that produce cars, construction vehicles, motorcycles, ATVs, and engines. Japanese automotive manufacturers include Toyota, Honda, Daihatsu, Nissan, Suzuki, Mazda, Mitsubishi, Subaru, Isuzu, Kawasaki, Yamaha, and Mitsuoka. Cars designed in Japan have won the European Car of the Year, International Car of the Year, and World Car of the Year awards many times. Japanese manufactured and designed vehicles have had worldwide influence, and no longer have the stigma they had in the 1950s and 1960s when they first emerged internationally.